Indramayu power station (also known as Indramayu Sumuradem) is a 990-megawatt (MW) coal-fired power station in West Java Province, Indonesia. A further 2,000 MW has been proposed. The photo below shows the plant, located in Sumur Adem Village, Sukra District, Indramayu Regency, West Java Province. The Indramayu power station is a three-unit, 990-megawatt (MW) coal-fired power station in Indonesia's West Java Province, owned by PLN. The three units of the Indramayu power station were built under Fast Track Program (FTP) Phase I. The three units were financed by a US$562 million loan from the China Development Bank, and built by CNEEC and Sinomach of China. In December 2014, Indramayu Regency officials alleged that a former Regency government official, Irianto M.S. Syafiuddin, had embezzled 4.1 billion Rupiah, or about $300,000, in the land acquisition process for the Indramayu plant in 2004. PLN is planning to build two additional 1,000-MW coal-fired units at this plant. Environmental permits have been difficult to obtain, and have caused significant delays, with the company still waiting on these permits as of December 2014. The company was hoping to begin construction in 2015, but was uncertain whether it would be able to. The 2015-2014 power supply plan for PT PLN lists the projected starting dates for Units 4 and 5 as 2019 and 2024 respectively. The 2016-2025 and the 2017-2026 power supply plans for PT PLN no longer list Indaramayu Unit 5. It appears the project has been abandoned. However, a May 2017 article on potential JCIC funding describes the project as 2 x 1000 MW, suggesting that Unit 5 is still under development. In the report, the Central Business Division Director of Central Java PLN, Nasri Sebayang, said that a 2 x 1000 MW expansion is now in the preparation stage of the tender documents for JICA funding, with construction beginnning in 2018 and ending in 2021. The plant would require US$4 billion. On December 6, 2017, the environmental permit for Units 4 & 5 was revoked by Bandung Administrative Court Judges. This ruling was in response to a lawsuit filed by Mekarsari and surrounding villagers who are members of the Indramayu Smoke Free Network (JATAYU). The residents argued the environmental permit for PLN’s proposed expansion had been improperly issued and there had been no public consultation with the affected communities. The decision will likely be appealed and ruled on by a higher court. In June 2018 PT PLN Persero announced that the targeted completion date for Units 4 & 5 had been postponed to 2027, meaning that they are shelved. The expansion has been opposed by local residents, who say the existing plant has already resulted in negative impacts to their livelihoods, and that the expansion would displace needed farming land. Executive Director of WALHI West Java Dadan Ramdan described the December 2017 revocation of the environmental permit for PLTU Indramayu 2 as a victory for villagers. 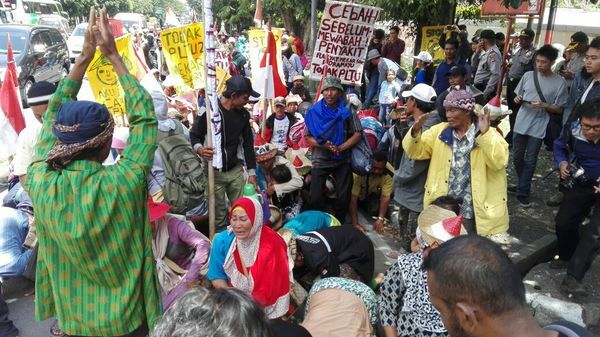 Protest against the proposed Indramayu plant expansion, photo undated. ↑ Yance Diduga Korupsi Rp 4,1 Miliar di Proyek PLTU Sumur Adem, Kompas, 5 Dec. 2014. ↑ Pembangunan PLTU II Terganjal Izin, Radar Cirebon, 27 Jan. 2014. ↑ Pembangunan PLTU II Indramayu Tunggu Amdal, Republika, 4 Dec. 2014. ↑ "Executive Summary: Electricity Supply Business Plan, PT PLN (Persero) 2015-2014,"
This page was last edited on 4 March 2019, at 20:27.